Delightful period property with charming oak beamed ceilings, stone floors and handcrafted chairs and tables. A time-travelling option as likely to please ale lovers as history lovers. Just 20 minutes from Andover and the South Downs National Park. 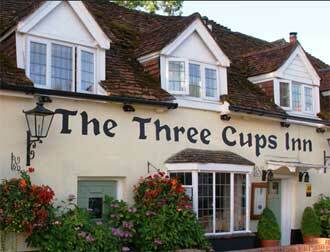 If you like cosy old inns with heaps of Tudor furnishings and a quintessentially English character, you'll love the Three Cups. The inn offers eight attractive guest rooms, each of them decorated and furnished to a very high-standard and each with their own unique atmosphere (the exposed red-brick walls and the occasional olde oak beam add more than a dash of medieval romance). All rooms are en suite and feature power showers, luxury 'Eden' toiletries, freshly ground coffee/tea-making facilities, FREE wi-fi, Flat Screen Televisions and crisp, white bed linen made form the finest Egyptian cotton. This AA Four Gold Star rated B&B can be found in the ancient village of Stockbridge, which sits at the heart of the Test Valley. Winchester is just a 30 minute drive and the hotel enjoys easy access to Andover and Harewood Forest. The hotel's award winning Chef has added a tasty and creative twist to classic British and French cuisine and the low beamed dining room with its candlelit tables provides the prefect setting for romance.